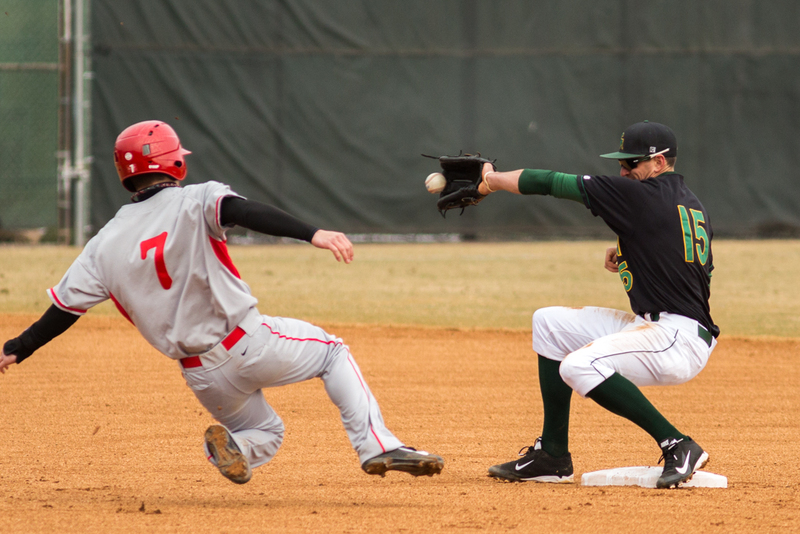 Shortstop Brandon Gum fields a ball vs. Hartford (Maurice C. Jones). Ashworth is expected to take the ball on the backend of Saturday’s doubleheader. Offensively, the Stags are led by Jake Salpietro, whose homerun in the sixth inning of game two vs. Richmond propelled Fairfield to its lone victory of the season. In five games, the sophomore is batting .368 with a slugging percentage of .632. Also homering against the Spiders was Jack Giannini, one of only four hits on the season for the graduate student who started 48 games in 2013. While Alex Witus has struggled connecting at the plate (.182) he has three stolen bases in as many games. On the mound, the Stags are led by the aforementioned Ashworth and sophomore Mike Wallace. Wallace, who went 6-4 as a freshman with a 3.39 ERA and 37 strikeouts, is 0-2 this season with a 12.96 ERA in only 8.1 innings. 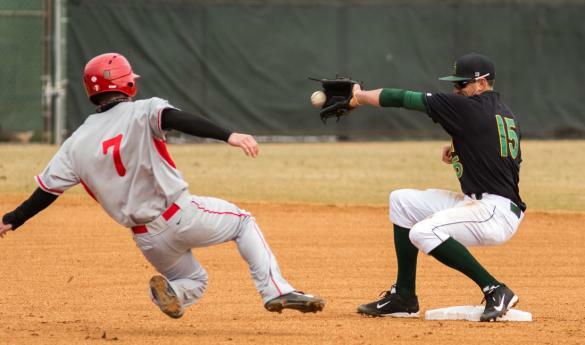 Entering weekend action, the Patriots have won three of their last four with the only blemish coming last Sunday in an entertaining 12-inning affair vs. Hartford University. At the plate, Mason is led by Chris Cook who has three home runs and eight RBIs in 11 games. The senior second baseman won A-10 Co-Player of the Week honors in mid-February after going 8-for-13 in the first three games of the season. Tucker Torbin, who led the team in batting average (.335), homeruns (eight) and RBIs (38) last season, has also seen the ball well in the early stages of the 2014 campaign. Through 11 games he has posted a .304 batting average with a team-high nine RBIs. Torbin drew a walk with the bases loaded in the first game vs. Hartford last weekend, allowing the only run to cross the plate in the game. BALL FOUR! Tucker Tobin walks on four straight pitches giving Mason the 1-0 lead. Hartford makes a pitching change. Where the Patriots have overpowered opponents, however, is from the mound. Mason has the fourth best team ERA in Division I (1.50) and has shutout the competition four times. Individually, Mason is led by redshirt senior Anthony Montefusco. Coming out victorious in all three of his appearances this season, Montefusco has yet to allow a run in 14 innings. Saturday Game 1 - 12:00 p.m.